*Disclaimer: The properties listed above are not necessarily represented by Keller Williams First Coast Realty – The Schwabe Group. 4154 Savannah Glen Boulevard, Orange Park, FL SOLD! This 3 bedrooms 2 bathroom home is located in Savannah Glen Orange Park, FL. Home on a Cul-de-sac that features a large backyard with a utility shed. This home has a nice open floor plan with vaulted ceilings makes the home feel big. The home also features wood laminate flooring, fireplace, new carpet, eat-in kitchen space, and inside laundry. There is plenty of shopping close by with the Oakleaf town center being around 5 minutes away and the Orange Park mall around 10 minutes away. If you need to get to NAS Jacksonville Navy base that is about 15 minutes away. It will take you about 5 minutes to gain access to I-295 which makes it easy to get to the airport, downtown Jacksonville, Jacksonville Beach, and St Augustine. What's My Orange Park Worth? We have seen 3 straight months of listing price increases on home prices in Fleming Island and don’t expect things to slow down anytime soon. If you are considering buying a home you can still find deals on a house in Fleming Island but having a good real estate agent who understands the market is a must. Don’t wait on the sidelines for too long, many of our listings are starting to sell within a few days of hitting the market. 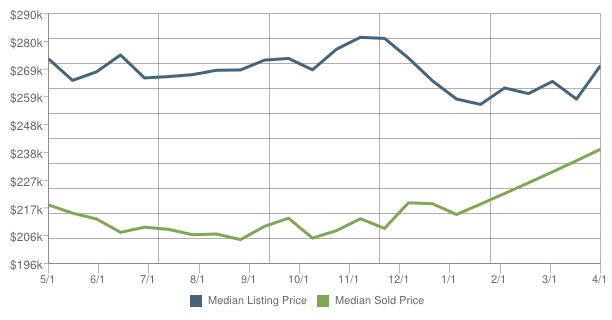 As you can see from the graph below, listings are not selling exactly for asking price. If you are interested in how much current inventory is on the market on Fleming Island you can find that information by clicking on the link. High inventory will suggest that homes are sitting on the market for longer. Currently in this area of Fleming Island, homes have a median time of 82 days on the market before they sell. This would suggest that buyers are in a great position to make an aggressive offer on a home. Sellers should make sure to price their home near the market value if they expect to get an offer from one of those interested buyers. Lower inventory and more home buyers in Fleming Island is causing multiple offers coming in on homes similar to what we saw back in 2006. I wouldn't expect home prices to run up quite as fast as they did back then as banks have gotten a lot stricter on lending guidelines and are no longer giving a loan to anyone with a pulse. But low inventory is one indicator that prices should continue to rise. The median list price in March for single family homes in Fleming Island is $350,318. The list prices increased by 2.1% from the previous month. The price per square foot for listings in this area is $128. The median sale price in March for single family homes is $208,000. The sale prices dropped by -7.6% from the previous year. The price per square foot for sales in this area is $107. Visit my website to search for homes in Fleming Island or to be notified when Fleming Island homes come on the market. To find out how much is my Fleming Island house is worth in the current market email me or call 904-403-2429. Real estate market data for Fleming Island, FL provided by Robert Schwabe of Keller Williams First Coast Realty. What's My Orange Park Home Worth? the information here at the updated Property Website! SOLD 6/30/2015 Nestled in the Heart of Orange Park, FL this wonderful home is located on just under an acre and has quick access to either Hwy.17 or Kingsley. This home has been updatingd and features new kitchen and bathrooms with updated cabinets and granite countertops. This home also features screened in pool, detached garage with work area, large shed, golf putting green, newer roof around 8yrs old, and a newer a/c system around 5-6 years old. There has been a mother-in-law suite added as the 4th bedroom which is handicap friendly in mind with it's own bathroom and a 36'' wide door leading out to the driveway. This is really one of a kind for Orange Park and really need to be seen. What's my Habersham Harbour home worth? Located right near the roundabout off of Oakleaf Plantation Pkwy. Forest Hammock is 6 miles from I-295, 10 miles from NAS Jacksonville, 24 miles from Jacksonville international Airport, 15 miles from Downtown Jacksonville, and around 25 miles from Jacksonville Beach. Homes in Forest Hammock were built by Drees Homes, Mattamy Homes, Pulte Homes, Richmond America Homes, and Standard Pacific Homes. Homes sizes start as small as 1266 Sq. Ft. all the way up to 3885 Sq.Ft. There is even a builder option of having a double master suite in one of the floor plans. Forest Hammock has reasonable HOA fees at around $315. annually which include some great amenities such as 3 playgrounds, soccer field, volleyball court, tennis court, and a zero entry pool with children’s splash area. The neighborhood was established in 2011 and will consist of around 699 homes. There is an Annual HOA fee of $315* with home prices starting Mid $150′s all this without a CDD Fee. Forest Hammock is in the Clay county public school district and is zoned for the following school for the 2014-201\5 school year. It’s always best to call the Clay school district at (904) 529-4954 to get the latest attendance zones. Brentley Ln., Cranbrook Ct., Deercroft Ln., Drysdale Dr., Forest Meadow Ln., Gilmore Ln., Glendale Ln., Grayfield Ln., Halifax Ln., Plantation Oaks Blvd., Wilton Ct. Please contact Forest Hammock homeowners association for latest fees. What's my Oakleaf Plantation Home Worth?